Deservedly acclaimed as one of 2015's best films, Brooklyn is the deeply emotional story (adapted from Colm Toibin's bestselling novel) of a young woman whose heart is divided between two countries. 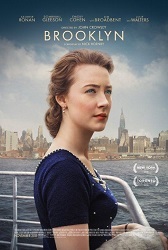 Set in 1952, the story centres on Eilis Lacey (Saorise Ronan) who has decided to leave her Irish County Wexford town to start a new life in America. However, this life-changing decision isn't without upset: she must leave her beloved mother and sister behind and once she arrives in Brooklyn, she suffers a devastating bout of homesickness. However, upon meeting charismatic young Italian-American Tony (Emory Cohen), Eilis starts to believe that she has a possibility of a future on American shores... That is until she is compelled to return to her home country, where she is faced with potential new suitor Jim (Domhnall Gleeson). Anchored by both Ronan's engrossing performance and a compelling sense of the wider Irish immigration experience (About a Boy author Nick Hornby adapts the novel superbly), Brooklyn is that rare movie that's emotional without ever being schmaltzy. Key to the movie's impact is the lovely score by Michael Brook, another component of the production that's earnest without ever becoming sappy. It's a difficult balance to pull off in film music but by taking his cue from Eilis' conflicted nature, Brook is able to convey a host of complex information even when the central character isn't saying a word. Although he's written music for several acclaimed films including Sean Penn's Into the Wild (for which he was Golden Globe nominated) and David O. Russell's The Fighter, Brook is best renowned as one of Canada's leading guitarists. 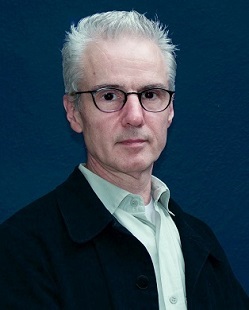 He's famous as the creator of the Infinite Guitar (allowing notes on the instrument to be held with infinite sustain), has collaborated with some of the biggest names in pop music, including Bono for 1986 movie Captive, and has enjoyed a studio career that dates all the way back to a 1985 collaboration with Brian Eno. If Brook's orchestral film music has been somewhat overshadowed when compared to the more celebrated aspects of his career, Brooklyn is surely set to change that. Fully lyrical with tasteful Irish-appropriate inflections, the score starts as it means to go on with the tender "Opening Titles": a violin (performed by Brook's wife) immediately establishes the Irish connection, accompanied by a wash of strings, a gentle piano melody, clarinet and mandolin. It conveys the essence of Eilis' journey in a nutshell. This purposeful, overarching theme extends throughout the score as a reminder of the story's wider context, including a jaunty mandolin adaptation in "Seasick", the anticipatory "Deck Discussion", the violin-led "Arriving in America" and the morose "Homesick" with its undercurrent of plucked strings keeping steady time. "Bookkeeping Class" straddles the divide between mournful and assertive, violin working alongside mandolin to give a sense of the purpose Eilis is striving to seek in her new life. "Packing for the Voyage" introduces what could be defined as Eilis' theme, leading with the violin to convey the heartrending sadness of her departure from Ireland. It's music that's deeply connected to the spirit of the land, brimming with poignancy yet also hope for a brighter future, especially when the strings rise up to support the melody. Like the "Titles" theme, it's also adaptable to a host of different contexts from the busy "Eilis Starts Work" to the deeply moving "Letter from Home", whose gentle strings emphasise her deeply felt connection with the Old Country. Later on, this is contrasted with the relatively more optimistic "Letter to Home" whose high-end strings and underlying pizzicato indicate that Eilis' life in America has become somewhat more harmonious. Given the story's rich connection to Irish heritage, it's only appropriate that Brook's score gives way to the stirring "Frankie's Song" performed by renowned Irish singer Iarla O Lionaird: it's another firm indication of the soundtrack's commitment to authenticity. It's then back to Brook: the brief "Tony Asks Eilis Out" is filled with romantic possibility, feelings that are capitalised on with "Things Are Looking Up", a delicate piano melody giving way to truly gorgeous strings. Needless to say, the film's narrative soon throws some curveballs Eilis' way, and Brook's score follows suit: the truly moving "Rose Dies" is one of the score's highlights and marks a turning point, the score darkening and maturing as Eilis is compelled to return to Ireland. From this point, the journey and Eilis themes work in tandem, alternating between desolation ("Mourning"; "Rose's Grave") and vibrant happiness ("Proposal"; "Getting Married"). As Eilis finds herself increasingly torn between Ireland and America, palpably emotional tracks like "The Pull of Home", "Tony's Letter" and Eilis Wavers' expertly pull on the heart strings without ever seeming sappy; instead, they glow with integrity, brimming with the import of the movie's narrative. The subdued "Confrontation" is probably the gloomiest track on the score, but only serves to make the glorious, climactic "Goodbye Eilis" all the more resonant, Brook building all of his themes and instrumental textures to bring everything to a fulsome close. Tinged with sadness initially yet building to a profound sense of optimism for a better future, it both summarises and rounds off our central character's journey in stirring fashion. A lovely clarinet/violin/piano/string ensemble then brings the "End Credits" to a close. 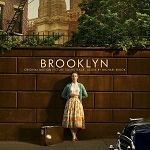 Michael Brook's score for Brooklyn is impressive in a number of ways. In terms of mirroring the emotional journey of Saoirse Ronan's character in the movie, the score is perfect, moving from heartache to harmony to disharmony and back to normality again. Like the movie, it's both intimate and wide in scope, a reflection of one of the 20th century's biggest cultural shifts as conveyed through the emotions of one young woman. Yet where the score really impresses is in its tact: never schmaltzy but always sincere, Brook manages that incredibly difficult trick of jerking the tears without ever seemingly overly manipulative. It's perhaps easy to assume that writing a score for a film like Brooklyn is easy; the real challenge comes in the subtle shadings and the feeling that any emotion has been properly earned. Brooklyn succeeds in all of these areas and then some. The score album can be found at the following links on: Amazon.co.uk and Amazon.com.